Eagle standard of the French 105th Regiment captured at Waterloo. Copyright National Army Museum. The industrial printing press was one of the most influential inventions of the Age of Revolution. It allowed thousands of copies of all types of written texts and images to be printed quickly and cheaply. Pamphlets, newspapers, handbills and books could now be mass produced and distributed, spreading news, ideas, political and social campaigns, propaganda, stories, poetry and more. The printing press had been invented in the fifteenth century by Johannes Gutenberg, allowing literature and literacy to become more accessible, and in turn influencing religious and political views around the world as it was widely adopted. Although they continued to be developed and refined in different ways into the eighteenth century, hand-operated presses remained rather slow and laborious. 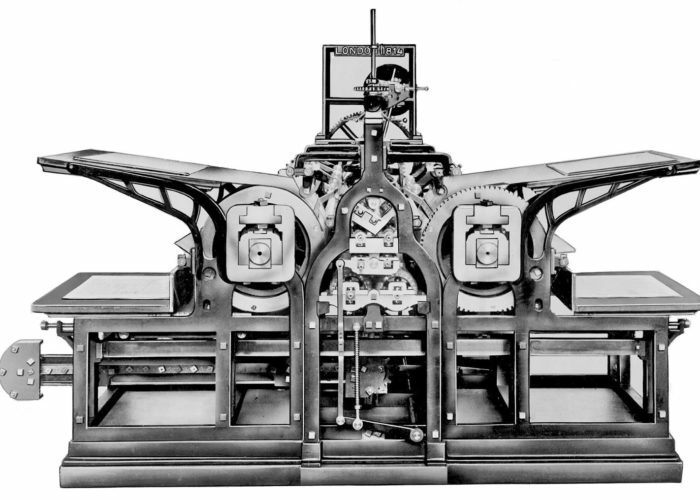 The invention of the industrial cylinder press, by William Koenig in the early 1800s,transformed the power of print, accelerating the pace of change, for instance by allowing radicalism and innovation to spread beyond the confines of one region across Britain and overseas. Its design was fundamentally influenced by two ideas. The first was the use of steam power to run the machine. The second was the introduction of rotary metal cylinders, which allowed each page to be printed on both sides at the same time. In the early 1800s, the German inventor William Koenig moved to London, where he patented his design. He set up a workshop with German watchmaker Andreas Bauer and began building and trialling his new printing press. Their first customer was The Times newspaper who bought two machines in 1814. They used them to print the 29 November issue in secret, so as not to upset the paper’s pressmen – who (like the luddites) had vowed to destroy machinery that might pose a threat to their jobs, or to withdraw their labour in protest. Control of the press – already an issue for many states seeking to suppress radical elements within their societies – became even more critical as a result. 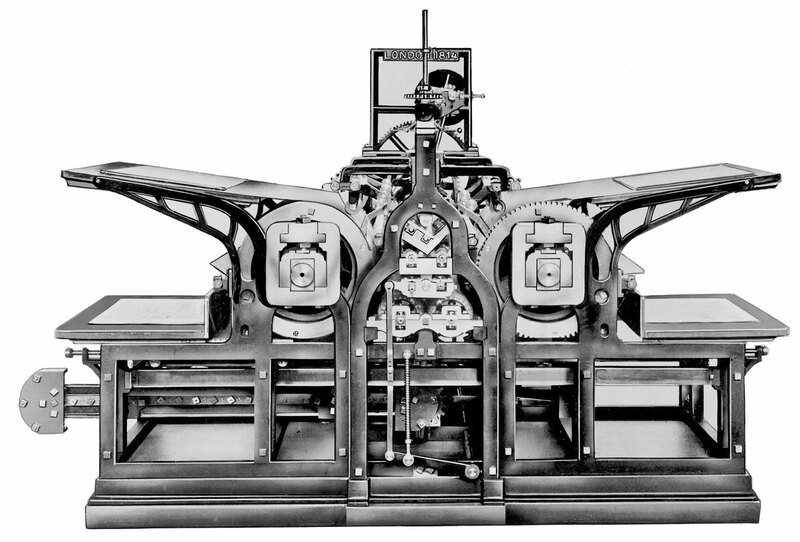 The new press rolled out 1,100 pages an hour – more than four times faster than the recently introduced Stanhope press. This was an extraordinary success for Koenig and Bauer, and placed The Times way ahead of its competitors in printing and labour costs. Koenig fell out with his sponsors and eventually returned to Germany in 1817 to continue his work. Koenig & Bauer went on to became a major company and a leading manufacturer of printing equipment, well into the 20th Century. Teeny Ted from Turnip Town by Malcolm Douglas Chaplin is the smallest book ever printed. Produced in Canada, it measures just 0.07mm micrometres by 0.1mm and has 30 ‘pages’. This object description and its related educational resources were researched and written by our team of historians and education specialists. For further information see the item’s home museum, gallery or archive, listed above. You can access a range of teachers resources related to this object and more on our education page. Please also see our glossary of terms for more detailed explanations of the terms used. You can download this image for personal and educational use but please take note of the license type and rights holder information.